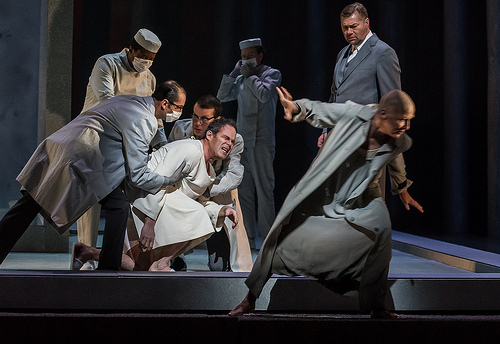 In the first of a series bringing you opera productions from London’s Royal Opera House, a chance to enjoy the company’s new staging of Richard Wagner’s epic masterpiece. Directed by Stephen Langridge and featuring Simon O’Neill, Angela Denoke, Rene Pape, Gerald Finley, Willard W White. The 5hour 45 min running time includes two intermissions. Must be 19+ to attend. 4. Select the number of tickets you would like from the “PROMOTIONAL COMP (2014 Vancouver Recital Society)”drop-down menu (Look for the little yellow star) and click “CONTINUE”. Limit 6 tickets per user. 6. Log in or create a new account to complete purchase. The art songs of Franz Schubert lie at the foundation of the lied genre itself, and at the pinnacle of Schubert’s lieder output stands Die Winterreise, a song cycle remarkable for its vivid musical portraits of the human heart smarting from the pains of love lost, and stoically resigned to the approach of death. Conceived as a journey into the cold of winter, it sets to music a selection of poems by Wilhelm Müller published in 1823 and 1824 under the title Seventy-Seven Poems from the Posthumous Papers of a Travelling Horn-Player. Unlike the composer’s previous song cycle, Die Schöne Müllerin (set to texts by the same poet), Winterreise presents more of a slide show than a plot, as all of the important action has taken place before the narration begins. The narrator- singer is heard in conversation with his own heart, by turns reflective, questioning, ironic, and finally resigned. In this speculative frame of mind, he drifts fluidly between the world of his dreams and the bitter reality he faces. At issue is a love affair gone wrong. The wanderer’s beloved has broken off their relationship to marry a richer man, leaving him despairing and alone with his thoughts, which travel through dark territory as he traverses village and country settings after leaving her house. The work was composed in two separate parts in 1827, the year before Schubert’s death, making the terminal illness from which he was suffering one obvious point of reference. But the poems from Wilhelm Müller’s collection provide apt imagery for such a presentation of moods, with their recurring themes of loneliness and isolation, watchwords of the emerging Romantic movement in art. The cast of characters with whom the narrator interacts are elements of the natural landscape (sun, wind, trees and leaves, flowers, rivers and snow, crows and ravens), elements that form symbolic company for his journey. Schubert’s achievement in setting these poems is to give musical life to these images, not only in the contours of the singer’s melody, but especially in the pictorial vividness of the piano score. The piano serves as more than mere accompaniment: it often acts out the role of the external surroundings through which the singer travels. One of the most alarming things I always find, when performing this work, is that there is actually so little on the page. He gets the most extraordinary moods and atmospheres with so few notes. And there aren’t any gloriously wishy-washy arpeggios to help you. You’ve got to create the mood by these few chords. He leaves it all very much up to the performers. “A stranger I came, a stranger I depart.” Beginning his lonely journey at a walking pace, our wanderer bids farewell to the house of his beloved, slipping off into the night accompanied only by the shadow of the moon. “Love wanders willingly,” he notes, with irony. The piano imitates a weathervane spinning atop his beloved’s house as the singer wonders about those inside. Do their affections also change with the wind? Why should they care about him, when their daughter is marrying a rich man? To the drip-drip sounds of the piano, he asks how his tears can have frozen to his cheek so soon. They were hot enough to melt ice when they poured from his heart. Alternating major & minor harmonies evoke both the warmth of feeling and the chill in the air of this scene. Stunned by the loss of his love, he searches frantically for any piece of green grass beneath the snow to remind him of happier times. But all is dead around, like his frozen heart. The agitated piano accompaniment portrays his inner turmoil, while the avoidance of cadence at the end paints his inability to let her memory go. As a chill wind blows in the fluttering piano accompani- ment, he passes by a tree into which he once carved words of love. Once the emblem of his happiness, it now offers him eternal rest beneath its branches. The simple tuneful- ness of this melody has made it into a well-known German folksong, Am Brunnen vor dem Tore. He muses on how the snow will absorb his tears, then thaw in the spring and flow with them into the stream. The flow of this stream will feel their warmth once again as it passes his beloved’s house. The ice covering the river, on which he has carved the story of his love affair, is like his heart: it rages with a torrent beneath. Near the end, the piano pulses with signs of his inner torment. Pursued by crows as he breathlessly escapes, the wanderer casts a nostalgic glance back at the town he is leaving, once so pleasant to his memory. And looking back, he still longs to stand in front of her house once again. The flickering light of a will o’ the wisp, imitated in the piano part, leads him astray into a mountain chasm. He has no worries, though, for as rivers lead to the sea, so human miseries, like the will o’ the wisp, are but a game, all leading to the grave. Pausing from the fatigue of his journey, he shelters in a little hut, but this bodily respite from the cold and wind only allows him to feel more keenly the burning sting of jealousy in his heart. Lost in a happy dream of springtime, our traveller is awakened by the rooster’s call and the shrieking of crows. Drifting between a dream state and harsh reality, he longs to feel once again the warmth of love. The piano score paints in turn the sudden shrieks of birds and the torpor of his drowsy eyelids. He travels on his way, lonely as a cloud drifting over the tops of the trees. The stillness in the air, the brightness of the scene, are no help to his pain. When storms raged he was less miserable than this. The gallop of horses’ hooves and the triadic call of the posthorn sets the second half of the song cycle in motion as our wanderer’s heart leaps with the arrival of the mail coach. Does it bring a letter from her? The frost on his head has made him look like an old man, a welcome thought. Then horror sets in as he realizes he is still young, with so very far yet to travel to the grave. The sparseness of the piano part creates a chilling stillness as sonic backdrop to these dark thoughts. Circling overhead, a crow, wonderfully imitated by the piano, has been following the wanderer. Is it waiting to feast on his carcass? Will this crow, unlike his beloved, stay with him till he dies? The traveller identifies with a lone leaf hanging on a barren tree, waiting to fall. If it falls, so too do his hopes fall to their grave. The piano paints a vivid picture of leaves falling all around him. As he passes through a village, dogs growl at him, rattling their chains. Everyone is in their beds, dreaming. Why should he stay with these dreamers, when his own dreams are all over? With the courage of desperation, the traveller faces an early morning storm that tears the heavens apart. Raging in the cold of winter, it is the very image of his own heart. He sees a light dancing in the distance, which might be a warm house with a loving soul inside. In the dream world he inhabits, even an illusion brings him some comfort. Avoiding the busy byways, he heads for wild and desolate places, ignoring every sign post but one: the one leading him to a place from which no one returns. A liturgical solemnity pervades the scene as the traveller stops at a cemetery filled with garland-bedecked graves that beckon him like a welcoming inn. All its rooms, however, are taken and he is turned away, so he resolutely resigns himself to continue on his journey. A plucky spirit overtakes him, as he dispels defeatism to face wind and weather, feeling like a god on earth. Major and minor tonalities embody the difficulties he faces and the courage he uses to face them. He sees three suns in the sky, and stares at them. He, too, had three suns once, but having lost the two he cherished most (her eyes), he now has only one, and he wishes that would go dark, too. old organ-grinder playing with numb fingers, barefoot in the cold, his begging plate lying empty as dogs growl at him. This is the only human being the traveller meets on his winter journey. Shall he go with this strange man? Will the organ-grinder play his songs?